We have a wonderful job here at the Craft Gin Club, that we get to work with the best gin distillers from around the world and taste some rare, beautiful spirits - and then we get to send them to you lot and tell you all about them! Since January 2015 we have tasted thousands of gins and only the best appear in the Gin of the Month box. We have collated this list based on the gin distillers we have been lucky enough to work with and we will continue to update the list as we meet (and drink) more of the world's best craft gin! So without further ado and in no particular order... here are some of the best gins in 2018! 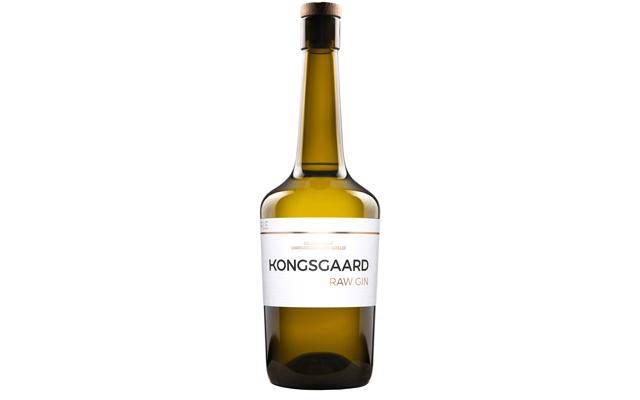 Orange, Juniper, Coriander, Lemon, Blueberries, Cardamom, Vanilla, Liquorice, Cueb Berries, Orris Root. Subtle notes of fresh citrus and light juniper lead, while distinctive tones of vanilla and blueberry round off some of the sharper fore-flavours and give the gin its characteristic smoothness. Best served with a small slice of orange, a twist of orange peel or blueberries; this is an easy drinking and versatile gin. Buchu, Baobab, Lion’s Tail, Devil’s Claw and African Wormwood, Juniper, Apple, Ginger, Mountain Pine, Orange Peel and Pimento. The taste is complex but strikingly smooth, encompassing floral, fruity and spicy flavours. This special batch places particular emphasis on herbal elements of the African botanicals. To craft the perfect serve of this exclusive gin, the Elephant Gin team recommend garnishing your G&T with a slice of fresh apple. This batch was made exclusively for Craft Gin Club, so you’ll only have tried it if you were a club member! Juniper, Coriander, Orange peel, Lemon peel, Elderberries, Elderflower, Apples, Cinnamon, Cassia, Wild Clover. A smooth gin with an exceptionally long finish. This special batch emphasises the Wild Clover element, while perfectly retaining the balance of this very special gin. Serve over ice with Franklin & Sons Natural Indian Tonic Water. Head Distiller David recommends 1 part gin to 2 parts tonic “as the gin is the main event after all!” Garnish with an orange peel twist. On the nose a soft, floral sweetness is balanced by notes of spice and citrus. A little dry juniper up front on the palate moves on to fragrant blossom, with hints of pollen and honey, then a complex array of more subtle spice. A long, lingering finish of light pepper and sweet pine blossom. Fill a glass with ice and add 50ml of Warner Edwards Honeybee Gin. Top up with premium tonic water and garnish with a slice of lemon and a sprig of sage. Alternatively, garnish with a slice of apple. Juniper, Coriander Seed, Cassia Bark, Cardamom Seed, Fresh Orange Peel, Angelica Root, Orris Root, Dandelion Root, Burdock Root, Elderberry, Silver Birch. A traditional London Dry with a lot of citrus and juniper. The eucalyptus in particular comes through nicely with tonics that aren’t too strong. Fever Tree Premium Indian Tonic Water really brings out this gin's notes and doesn't smother them like other tonics might. As for garnish, grapefruit, orange peel or a sprig of rosemary. Juniper, lemon peel, coriander, ginger, cinnamon, lavender. A floral and fruity aroma. In the mouth, its texture is very smooth – even creamy. The flavour is well-balanced and sophisticated, with woody and herbal tones that combine with a pronounced juniper note, as befits a London Dry. There is a refreshing citrus element to round off the taste. 40ml Windspiel Premium Dry Gin and Windspiel Tonic Water with ice in a highball glass. Garnish with orange zest. Juniper Berries, Coriander Seed, Angelica Root, Orris Root, Cassia Bark, Bitter Orange Peel, Lime Peel, Gorse Flowers, Elderberries and Samphire. On the palate, this unique and intractable spirit balances the bite of juniper and the spice of cassia with the fresh Dorset notes of elderberries, samphire and handpicked gorse flowers. Complexed and balanced in the mouth, this spirit can hold its own. For the perfect Conker Gin serve, combine 50ml of Conker Gin with a premium tonic water in a glass packed with ice. Garnish with a twist of lime peel. Juniper, Coriander, Orris, Wild Fennel, Lavender, Olive Leaves, Thyme, Lemon, Verbena, Sage. Fresh and herbal on the nose, with lemony hints of the Tuscan countryside, on the palate this gin is full with juniper, balanced beautifully by wild fennel, lemon verbena and thyme. On the finish, the gin is long and smooth, the rich botanical flavours combining to give a sophisticated, lingering finish. Fill a glass with ice and combine 50ml of Sabatini Gin with premium tonic. Garnish with a lemon peel, along with a sprig of either lemon verbena, sage or thyme. Juniper, Coriander, Cubeb Pepper, Cardomom, Nutmeg, Lemon Peel, Orange peel, Gorse Flowers. To best bring out the flavours in your Blue Bottle gin and tonic, mix the tonic and gin generously and garnish with a wedge of pink grapefruit. A closely guarded botanical blend that includes juniper, sea buckthorn, mint, rosemary, rosebud and raspberry leaves. Purposefully juniper-forward (the Finns are sometimes called the Juniper People for their strength), the addition of rosebud and raspberry leaves imparts Kalevala with a pleasant, slightly floral sweetness bolstered by the freshness of mint and one secret ingredient. Combine 50ml of Kalevala with 20ml of freshly squeezed lime juice and a premium tonic in a glass with lots of ice. Garnish with sea buckthorn berries or, if you can’t get your hands on any, cranberries make a fabulous substitute. Rich juniper flavour dominates this punchy, intense gin. Just three botanicals allow for incredible precision; on the nose, tangerine, black pepper, lemongrass and coriander scents blossom, carrying through to the palate. The finish is creamy, descending into herbaceous and earthy notes. Pack a glass with ice and add 50ml of Elg Gin No. 1. Pour in a premium tonic of your choice and garnish with a slice of lemon. Juniper, Coriander, Linden, Apple, Liquorice, Apricot, Almonds, Saffron, Clove, Bitter Orange, Cucumber, Lime. On the nose, note the subtle aromas of liquorice root, apple and apricot. On the palate, the freshness of juniper is bolstered by citrus notes, joined by a chorus of fruit and fresh herbal notes. The long finish is fresh and spicy, with notes of close and saffron. Fill a glass with ice and add 50ml of Osmoz Citrus Gin. Top up with the premium tonic water of your choice, and garnish with two sliced strawberries and four basil leaves. Juniper, Coriander Seed, Orris Root, Cubeb Pepper, Clove, Cinnamon, Star Anise, Orange Peel and Cranberry. Rhodiola Rosea, Rowan Berries, Sea Buckthorn, Blaeberries, Verbena, Coriander Seed, Cardamom and Juniper from two different countries - Italy and Bulgaria. Initially the earthy warm Italian juniper will give way to the lemon sherbet of the Bulgarian juniper, before a nice jammy flavour develops thanks to the blaeberries, hawthorne and rowan berries. Finishing off with liquorice, cinnamon and our lovely Rhodiola rosea! Fill a glass with ice and add 50ml of Rock Rose CGC Distiller’s Edition. Top with 75ml of Premium Tonic and garnish with a slice of pink lady apple. Juniper, Coriander, Lemon, Grapefruit, Dandelion, Burdock, Vanilla, Elderberries, Cassia, Liquorice, Grains of Paradise, Angelica. Fill a glass with ice and add 50ml of Bordiga’s Occitan Gin. Top with Fevertree Mediterranean Tonic and garnish with slices of strawberry and a sprig of rosemary. Juniper, Coriander, Angelica Root, Grapefruit, Lime, Black Pepper, Bay Leaf, Cardamom Seed, Cotswolds Lavender. Fresh citrus notes of grapefruit upfront with earthy coriander backed-up by sweet floral juniper. Soft notes of cracked black pepper with a hint of minerality and perfumed Cotswolds lavender. Over lots of ice, with a splash of classic Indian tonic water and a slice of pink grapefruit and a fresh bay leaf. Juniper Berries, New Zealand Coriander Seeds, Yen Ben Lemon Zest, Orange Zest, Cinnamon Quills, Almonds, Cassia Bark, Orris Root, Liquorice Root. Lighthouse Gin is pure and complex, with magnificent lemon and juniper accents to begin, a finely spiced midpalate and a soft, lingering finish. Fill a glass with ice and add 50ml of Lighthouse Gin, followed by your favourite premium tonic. Garnish with a slice of lemon. Juniper, Angelica Root, Orris Root, Caraway Seed, Chinese Lemon, Kaffir Lime, Coriander Seed, Meadowsweet, Cardamom, Star Anise, Oriental Grapefruit and Gunpowder Green Tea. Delightfully fresh and rounded up front, first on your palate will be citrus juniper and subtle notes of spice, followed by the unusual flavour of gunpowder tea, the sweetness of meadowsweet and lemony coriander. A very well balanced and surprising gin. Serve Gunpowder Gin in a glass with lots of ice, a premium tonic water and a slice of fresh red grapefruit to emphasise the refreshing citrus notes. To make “Ireland’s favourite G&T” – as voted for by the Irish public as part of the 2016 Irish Gin & Tonic Fest – use elderflower tonic water and garnish with three raspberries and a slice of grapefruit. Juniper, Angelica Root, Liquorice, Coriander Seeds, Lemon Peel, Cassia Bark, Black Peppercorns, Rosemary. Invigorating fresh pine and eucalyptus, floral and herbal rosemary notes with touches of zesty lemon citrus. Robust juniper supported by citrus and savoury notes, black pepper spice with hints of liquorice contributing to a fully rounded and balanced mouthfeel. Long smooth dry finish, with notes of angelica and lingering warm pepper spice and rosemary. Try with a high-quality tonic water, finished with a slice of mild green chilli. Tasmanian Pepperberry Leaf, Lemon Myrtle, Cinnamon, Cardamom Pods, Coriander Seeds, Star Anise, Juniper Berries, Lavender, Angelica Root and Whole Fresh Oranges. Light and sweet juniper opens into candied peels and angelica, with warm cinnamon and pepper building to a spicy mid-palate with subtle fruity notes. The finish is dry, with notes of liquorice and lemon. Add ice to your favourite gin glass. 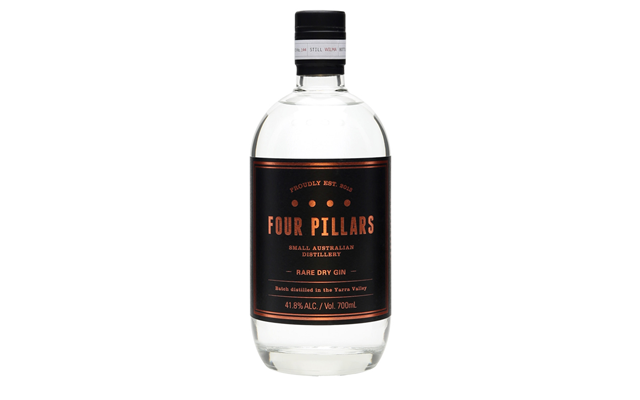 Add 45ml of Four Pillars Rare Dry Gin, top with 60ml of tonic water and garnish with grapefruit or orange. For a Four Pillars twist, add a dash of Campari and garnish with a wedge of lime to create what Stu likes to call a Keating. Juniper, Lemons, Limes, Orris Root, Angelica, Coriander seed, Coriander Root, Wattleseed, Cinnamon Myrtle, Lemon Myrtle, Liquorice Root, Allspice. Always serve with lemon, as it cuts the sweetness of the tonic and balances the drink – as opposed to lime which dominates the drink. Juniper, Milk Thistle, Coriander, Angelica, Sweet Orange, Bitter Orange, Lemon, Orris root, Liquorice, Cassia, Clove, Pine, Heather, Lemongrass, Lemon Balm, Chamomile, Kaffir Lime Leaves. Gently infused with rose petals and hibiscus flowers. A juniper-led, citrus gin, with a fresh, light and floral character. A rich, velvety texture. Spice at the beginning, then notes of vanilla, nutmeg, and cardamom, with just a hint of chocolate. Following this are some full fruit and floral notes, including elderflower and citrus blossom. Great as a G&T but also nice with prosecco. The perfect combination for an Elderflower Gimlet cocktail, we suggest a double measure of Elderflower Gin, a measure of sugar syrup, and some lemon juice. Shake over ice and strain into a frozen martini glass. Garnish with Lemon. The piney freshness of juniper leads, thanks to the unique double distillation process used at the Boatyard Gin distillery. Light and elegant on the palate, floral notes are balanced by the sweetness of liquorice root, with a hint of vanilla developing on the finish. Pack a glass with ice and add 35ml of Boatyard Double Gin. Add 100ml of your favourite premium tonic and garnish with a wedge of pink grapefruit. Voted 2017's gin of the year by our members! Frankincense, Myrrh, Coriander Seeds, Cloves, Orange Peel, Angelica Root, Lemongrass, Cinnamon Bark, Juniper Berries, Allspice Berries, Cardamom, Nutmeg. A fresh burst of juniper is followed by a mix of lovely spices, wrapping their arms around your senses. Tangy liquorice and background notes of clove sit on top of an earthiness that acts as an undertone to the total sum of flavour. The heat slowly fades to reveal subtle notes of cinnamon, which call you back for more. Pack a glass with ice and add 50ml of Batch Premium Gin, followed by the premium tonic of your choice. Garnish with frozen raspberries and a twist of lime. Juniper, Coriander, Angelica Root, Orris Root, Liquorice Root, Liquorice Bark, Fresh Organic Lemons, Elderflower, Red Clover Flower, Yarrow, Ox Eye Daisy, Wild Raspberry, Blackberry Leaves, Wild Rose, Watermint, Sweet Woodruff, Wild Angelica, Lemon Balm, Sweet Cicely, Lady’s Bedstraw, and Bell Heather. The first gin to represent an entire year in beautiful Glendalough, the Garden of Ireland. On the nose this gin has fresh spring notes of juniper, citrus and pine. On the palate, it starts cool and mellow, then rushes to summer flowers in full bloom. Hints of autumn fruits give way to warm winter spices and a long, sylvan finish. The perfect Wild Botanical G&T can go one of two ways. Combine your Glendalough Wild Botanical Gin with a premium tonic – such as Poacher’s Irish Tonic – and garnish with either a mint sprig and orange slice, or rosemary and a slice of pink grapefruit. Sláinte! Macedonian Juniper, Ruby Grapefruit Peel, Lemon Peel, Lime Peel, Coriander, Angelica Root, Orris Root, Bay Leaf, Chamomile, Cinnamon, Cubeb Pepper, Liquorice Root, Green Cardamom. Citrusy and floral on the nose, on the palate the earthy, resinous notes of juniper combine with warming, spiced citrus. A fruity, peppery heat from cubeb pepper mingles with the warmth of cinnamon, descending into a finish lengthened by green cardamom. Fill a glass with ice. 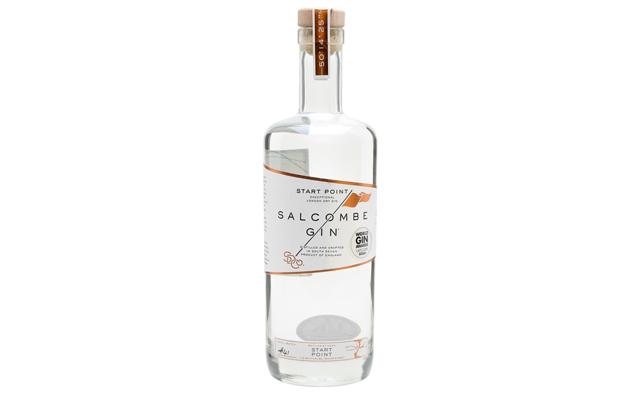 Combine 50ml of Salcombe Gin with the premium tonic water of your choice, and garnish with a slice of ruby grapefruit. To be a little more creative, add salt and pepper to really get the herbal note in Hernö Gin going, or pair with Fevertree Aromatic Tonic to add an extra, unique dimension. Juniper, Coriander, Orris Root, Thistle, Black Pepper, Black Cardamom, Orange Peel, Calamus Root, Mace, and Locally Sourced Honey. With a certain buttery quality thanks to its wheat base spirit, this gin is a beautiful tribute to a beloved father. His favourite food – honey – lends the gin its characteristic sweetness, while the botanical blend gives it the weight of liquorice and a woody character as the essential oils come alive on your palate. For a Christmassy twist on the gin and tonic, combine AK’s gin with a premium tonic. Garnish with a cinnamon stick, an orange peel twist and a single maraschino cherry. Juniper, Coriander, Fresh Sweet Orange, Lemon Zest, Grapefruit Zest, Angelica Root, Orris Root, Green Cardamom, Bitter Almond, Cinnamon, Liquorice Root, Violets, Rosemary, Thyme. An aromatic, contemporary take on a London Dry Gin, Tarquin’s combines dry juniper and bright citrus with more unusual floral notes. The rosemary and thyme in this special edition adds to the gin’s savoury character. Matches well with Fevertree Mediterranean tonic. Garnish with grapefruit zest and a sprig of fresh lemon thyme. Juniper, Coriander, Orris Root, Angelica Root, Cassia Bark, Liquorice, Cubebs, Kentish Hops, Kentish Lavender, Kentish Elderflower, Kentish Rose Hips, Kentish Samphire, Camomile, Lemon, Bitter Orange, Kaffir Lime Leaves. The classic juniper slowly eases into a more citrus tongue, before making way for sweet, spicy notes. A soft & creamy initial offering belies the complexity of tastes that reveal themselves as the spirit unwinds across your palate. Serve with a premium tonic and garnish with a wedge of lime or a piece of samphire. Juniper, Heather, Yarrow, Chamomile Flower, Bilberry, Angelica Root, Meadowsweet, Sorrel, Calamus Root, Elderflower, Pine Shoot. Intense juniper greets the nose, with the aromas of a pine forest. On the palate, an earthy sweetness is enhanced by peppery and herbal flavours. A clean, herbaceous finish lingers with a slight floral sweetness. Pack a glass with ice and add 50ml of Vidda Tørr Gin. Top up with the premium tonic of your choice and garnish with wheels of lime. Juniper, Coriander Seed, Orris Root, Angelica, Cubeb Pepper, Egyptian Lemon, Pink Grapefruit, Bergamot, Bourbon Vanilla. Confident juniper on the nose, with softly-balanced scents of eucalyptus from the cubeb pepper. On the palate, spice rolls into fresh juniper and rising citrus, trailing off into elegant bergamot. Dry, elegant citrus peel and a distinctly floral finish draw the drinker back for another sip. Fill a glass with ice and add 50ml of 58 Gin. Top with a premium tonic and garnish with a slice of pink grapefruit. Juniper, Dandelion, Burdock Root, Orange, Lemon, Coriander, Raspberry. An unmistakable raspberry aroma with a slight citrus and juniper trace. A sweet yet gentle tone of raspberry, underpinned by a clear gin character. Angelica, Birch Leaf, Caraway, Cinnamon Bark, Lemon Peel, Orange Peel, Coriander, Cardamom, Meadowsweet, Hibiscus, Sea Buckthorn, Orris Root, Juniper, Elderflower, Cranberry. Juniper, Orange, Lemon, Orris Bark, Coriander Seed, Angelica Root, Rhubarb Extract, Ginger Extract, Liquorice. Take a highball glass and fill with cubed ice. Add 50ml Whitley Neill Rhubarb and Ginger Gin, 15ml Lemon Juice and top up with Lamb & Watt Hibiscus Tonic. Give it a quick stir to infuse, and garnish with orange slices. Juniper, Chamomile, Lemon Balm, Lime Flower, Grapefruit Peel, Coriander Seed, Sweet Orange Peel, Lemon Peel, Angelica Root, Liquorice, Cassia Bark, Orris Root, Cloves. Juniper, Coriander, Angelica Root, Liquorice Root, Lemon Rind, Fresh Grapefruit, Sweet Orange. Zesty and ripe, on the nose this gin has light fresh aromas of juniper, orange and lemon. The palate is clean and characterful, with zesty, sweet citrus and hints of vanilla. The finish is warming with notes of sweet pepper and lemongrass. Fill a glass with ice and add 50ml of Six Bells Gin. Top up with 150ml of your favourite premium tonic. 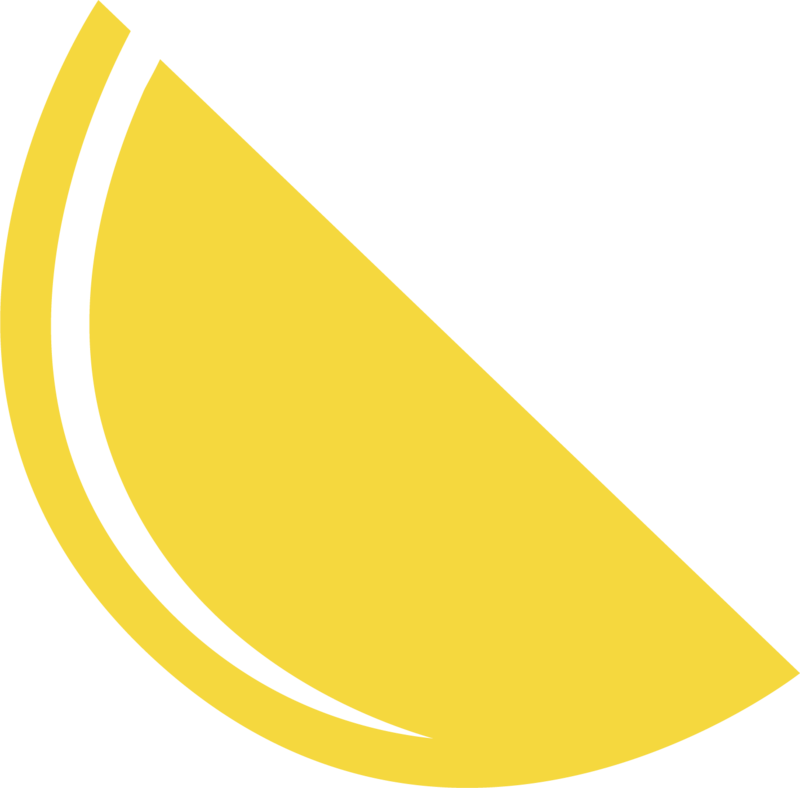 Garnish with a slice of lemon. Juniper, Coriander, Rock Tea, Cardamom, Angelica Root, Cinnamon, Bitter Orange Peel, Mandarin Peel, Hibiscus, Pink Pepper, Raw Marcona Almonds, Orris Root. Juniper, Coriander Seed, Wild Water Mint, Grains of Paradise, Angelica Seed, Orris Rot, Liquorice, Sweet Orange, Bitter Orange, Key Lime, Summer Savoury. The neutral grape spirit base helps to give a soft mouth feel and bring forward floral notes as it combines with the citrus botanicals. Overall there is a gentle delivery of the botanical flavours which end up with a spicy peppery note delivered by the grains of paradise working with the juniper. Chilgrove is a big, powerful, complex gin that is seriously smooth with a superb length. Pour 2 measures of Chilgrove Signature Edition Gin into a Collins glass over chunky ice cubes and top up with tonic water. Garnish with a generous sprig of freshly picked English mint. Juniper, Coriander Seed, Angelica Root, Star Anise, Liquorice Root, Fennel, Cardamon, Savoury Leaf, Chamomile, Nutmeg, Spearmint, Peppermint, Ginger, Cloves, Cinnamon, Lemon Peel, Clover and Elderflower. Pour 1 part gin, 2 parts Mediterranean Tonic over ice. Garnish with lime or kiwi. Seaweed, Juniper, Angelica root, Savoury leaf, Spearmint , Peppermint, Cardamon, Ginger, Cloves, Marjoram, Tarragon, Cayenne, Thyme, Parsley, Orange peel, Lemon peel. Iodine brought on by the seaweed with subtle juniper, with the citrus coming through as the perfect accompaniment to seafood. Juniper, Bitter Orange, Lemon, Lemongrass, Coriander, Liquorice Root, Angelica Root, Cinnamon Quills, Myrtle Pepper, Bitter Almond, Green Cardamom, Orris Root. Juniper upfront, with a very silky, viscous texture. The start is classic in style, but followed by a pop of intensity with coriander, bright floral notes, and citrus peel. The profile then develops into warm, sweet spice notes that lead onto the finish, which is long, lingering, and dry. This is a great example of how a distiller can achieve a procession of character and varying intensity in their gin. Serve with a premium tonic, ice, a sprig of rosemary and a grapefruit twist. Juniper, Coriander Seed, Meadowsweet, River Mint, Roasted Wattleseed, Strawberry Gum, Lemon Myrtle. A bright, lifted gin with beautiful citrus notes and a cut-grass character. The palate is weighty with a fresh, pine forest character. Clean and pure, in a classic London Dry style. Fill a glass with ice and add 50ml of Dry Island Gin. Add 150ml of your favourite premium tonic, and garnish with a slice of lemon and a sprig of thyme. Juniper, Coriander, Angelica, Orris, Sage, Thyme, Cassia, Rose Petals, Chamomile, Szechuan Pepper, Mace, Cloves, Orange Peel, Lavender. Refreshing orange on the nose is followed by mellow, herbaceous notes and the warmth of spice. On the palate, fresh and floral notes of rose blossom up front. Orange gently creeps in, followed by thyme and pepper, fading into a warm, mellow finish, rich with the flavours of clove and orange. Fill a glass with ice and add 50ml of Richard III Gin. Top up with your favourite premium tonic – the Burleighs team uses Mediterranean tonic. Garnish with rose petals and blood orange - or pink grapefruit if blood orange isn’t available - for a princely tipple. Red Grapefruit Peel, Red Grapefruit Juice, Grapefruit Zest, Cinnamon, Ground Almonds, Coriander Seed, Juniper, Angelica Root, Orris Root. This gin was designed to be citrus-forward, and flirty red grapefruit peel and red grapefruit juice form the cornerstone of its botanical blend. The bright burst of grapefruit explodes on the nose. On the palate, the zest of grapefruit plays a starring role, supported by warming cinnamon. Ground almonds give Filska the classic Shetland Reel smoothness, while the elegant notes of coriander seed and piney juniper play a vital role in the structure of this gin. Angelica root and orris root bind these flavours together to fabulous effect. To make the perfect Shetland Reel Filska Gin and Tonic, add 50ml of Shetland Reel Filska Gin to a glass packed with ice and top up with 150ml of your favourite premium tonic water. Garnish with a slice of red grapefruit and get ready to dance! Juniper, Coriander Seed, Cinnamon Bark, Angelica Root, Lemongrass Stalks, Orange Peel, Cardamom, Clove, Crushed Nutmeg, Frankincense, Myrrh & Whinberries. Sweet berry with spicy hints on the nose. The whinberry, blueberry & juniper flavours are big - a complex spirit which balances well with ginger ale, or splashed in prosecco. Fill a glass with ice, swirl and drain excess water. Add 50 ml Whinberry gin, top up with ginger ale and garnish with a slice of lime.